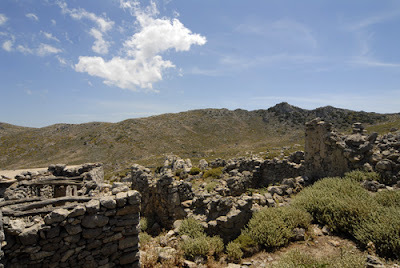 "A small castle was located near the village Sitanos of Sitia Region, namely Skalia. Skalia was a small village with a few residents built atop a mountain slope, where the outer walls of the houses formed a wall that surrounded the village, while from the north it was protected by cliffs. Today Skalia village is abandoned (only the Church of St. George and one house are standing), but the visitor can still discern the walls of the village - castle. Moreover, every year, during the feast of Agia Paraskevi in Ziros, the soldiers are commemorated."